In a startling and very positive new twist to the intense drama unfolding in the Middle East, the prospect for an all-out Israeli-Iranian war now appears to have been pushed back by eight to ten months. Israeli Defense Minister Ehud Barak was interviewed by a British newspaper this week. Barak indicated that while events could change yet again, it would now appear that the likelihood of a major war with Iran before next fall has been significantly reduced. 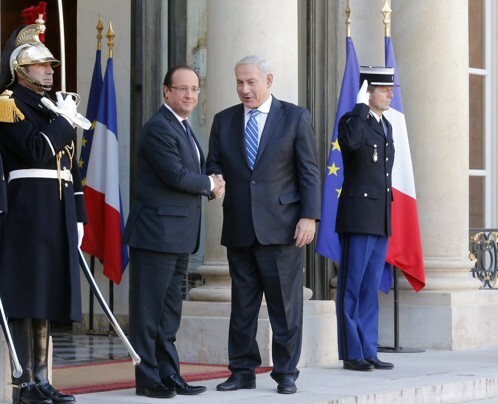 Prime Minister Netanyahu is currently in France. He told the Paris-Match that an Israeli first strike on Iran would be welcomed by the Arab world, which fears the Persians getting the Bomb. Still, he, too, is telling French President Francois Hollande and senior officials in Paris that war isn’t imminent and is asking them to press forward with even tougher economic sanctions on Iran. This is a welcome relief and a huge answer to prayer. With the prospect of war seeming imminent just a few weeks ago — for reasons I explain in the new ebook, Israel At War: Inside The Nuclear Showdown With Iran — Christians all over the world have been praying for peace, according to Psalm 122:6, which commands believers to “pray for the peace of Jerusalem.” Iran’s decision to step back from the brink of building the Bomb has, for now, relieved tensions with the Obama administration. It has enabled Netanyahu to feel comfortable to call for new Israeli national elections in February. It is encouraging Jewish and Christian tourists to continue visiting Israel. Indeed, The Joshua Fund tour of Israel and 2013 Epicenter Conference remains on track for next June. Please get details here and sign up to join us. We would be honored to have you with us.What I find intriguing is that Barak indicates that war was increasingly likely this fall. The Israelis were preparing to hit Iran before the U.S. elections. But by the grace of God, something happened in Iran that unexpectedly changed the dynamic. Here’s the story as we know it so far. “There could be at least three explanations,” Barak told The Telegraph. “One is the public discourse about a possible Israeli or American operation deterred them from trying to come closer. “It could probably be a diplomatic gambit that they have launched in order to avoid this issue culminating before the American election, just to gain some time. >> Help The Joshua Fund care for the poor and needy in Israel, teach the Word of God in the epicenter, educate and mobilize Christians around the world to bless poor and needy Israelis, train pastors and ministry leaders in Egypt, strengthen the believers in Syria, and prepare for a possible major new war in the epicenter — please prayerfully consider a generous, tax deductible financial contribution to The Joshua Fund.